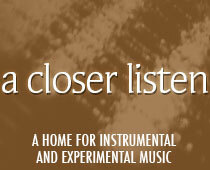 At A Closer Listen, we wholeheartedly endorse, approve of and recommend the compilation approach. Unfortunately, it’s hard enough for artists as it is. It’s been that way for years, so a compilation album isn’t just a great (and sometimes necessary) promotional tool, but a genuine dollar note in a world littered by thousands of grimy dimes. Discovery is a new series that aims to promote brand new and upcoming ambient artists. Here, promotion sits side by side with true discovery. Ambient, drone, electronic, noise and modern classical – you’ll find it all here in these forty tracks. New sounds emerge; it doesn’t take long before you realize you can drown in the music, and it’s entirely free. After already eclipsing a thousand downloads despite being released earlier this month, Discovery 1 is a pure pleasure. A couple of familiar names contribute to the record (Linear Bells, Lost Trail, Martin A. Smith), but they’re tracks that haven’t seen the light of day. The unheard of artists shine like the brightest of stars, and what a thrill it must be to feature on such a compilation. Some drift by slowly, others are rain-soaked sighs that ghost around, levitating in and around the compilation. At one point, a piano sits, playing alone. Even though the entire compilation has been chilled in the freezer, it’s an especially placid moment; a blue sea of serenity. The piano also prevents an electronic overdose, giving relief – not that any relief was really needed – and providing a welcome, extremely pleasant sound. In this modern age, the piano’s quiet beauty can be lost, shrouded and bypassed for an electronic drone. Of course, the piano can and is used in ambient music – Harold Budd and Brian Eno brought that to our attention with Ambient 2: The Plateaux of Mirror. More recently, Goldmund has continued to promote the lovely serenity of the piano. And with such a wide spectrum of sounds on display, there’s something for everyone. For just a moment, Cobalt Rabbit’s “Alone In The Stars” shares a vein with the warm soul of “Rhubarb”, a classic from Aphex Twin’s Selected Ambient Works Vol. II. Like much of music in general, ambient is shaped and inspired by the past, and both the melody and the texture bring a smile of reminiscence. A cello’s strings darken the mood, providing shadows and contrasts to the lighter, dappled sunshine. Some others are washed out with a pale shade of blue that passes over the music, and others still are left permanently in utter darkness, like exiled roses forever lost, suppressed by a gloomy kind of shade and unable to find any kind of light. Veering off into more of a frenetic, experimental vibe, a wonky, queasy guitar melody sings out its psychedelic chorus and is buried under an avalanche of effects pedals. Kissy Suzuki’s “M*” trades the tranquil for a synth-laden, abrasive drone that has a little bit of jealous malevolence to it. There aren’t any limits in terms of track length, either, ranging from voyages to shorter daydreams. Later, the music enters deep space. “No Breeze” by Jose Soberanes has something of a Steve Roach feel to it, the sound of infinity as it streams through the white stars and the creamy seashells of the shore, of angelic stone statues perpetually inhaling the dust of past centuries. “Raise The Sunlight” (Inhmost) and “Clumps and Plough” (The Volume Settings Folder) are also wonderfully serene.